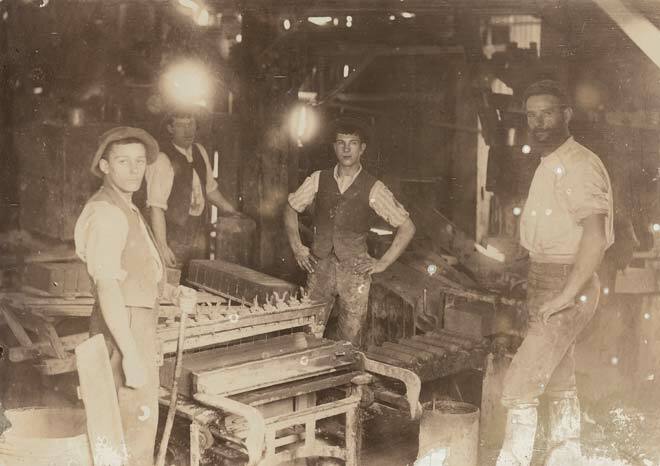 Four workers at Enoch Tonks’s brick factory in Webb St, Wellington, pose for a photograph while cutting slab clay. In the later 19th and early 20th centuries small factories like this one still had many of the work patterns typical of artisan workshops. The owner or members of his family often worked side by side with employees. This group includes (from left to right): an unknown worker, Alf Anderson, Alec Campbell and William Tonks (Enoch's son).